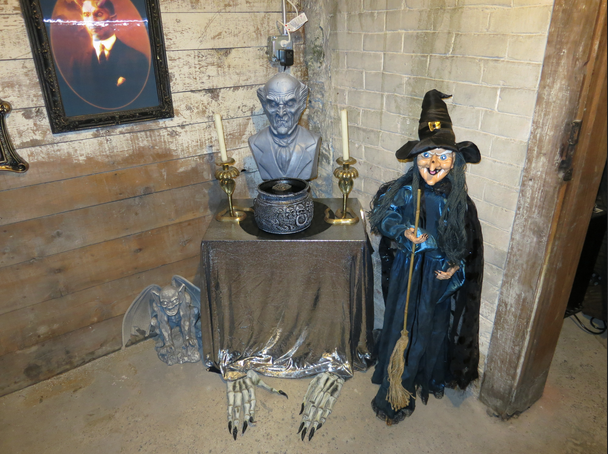 The Barrett family (no relation to the people who run Barrett’s Haunted Mansion in Abington, MA) have been running a haunted house in their basement since 2004. Created by Sophia Barrett as a way to raise money for charity, the haunted house has received support not only from her parents but also from several organizations and netted her a Nally Award in 2012. It is only open one night a year, usually on a Friday (but will open on a Sunday instead if there’s rain). While free parking is usually available about a block from the haunt, I recommend stopping by much earlier to scout out some potential areas because the haunted house is very popular and spots fill up fast. The line builds up quickly, so expect to spend some time outside and bring a jacket. There are also plenty of baked goods for sale if you get hungry. Its being open to people of all ages is one of the reasons for its popularity, as is how customers are able to choose the level of scariness they will experience when they go through: “No scares,” “Medium scary” and “Very scary.” “No scares” is pretty self explanatory, the performers just stand around and act friendly (and will take off their masks upon request). “Medium scary” has the monsters lurk around and “Very scary” has them use more advanced scare tactics and even touch you. Each ticket costs the same, but the monster at the start of the haunted house calls out the level you (or if you’re not alone, your group) has selected and uses a special noisemaker for each level. Those who opt for the “Very scary” version also have to wear a special lei that you return at the end of the haunt. This lets families visit each year and adjust the level of scariness as their children get older. The ticket taker was always ready to assist if people were having trouble deciding on a level and I loved how she reacted to kids who wanted to jump right to the scariest level. “Are you sure? The monsters haven’t eaten since last Halloween!” Classic. Naturally, I opted for “Very scary” and can vouch for the experience not being for little kids. While there are several instances where monsters jump out at you, they also use other methods. Some distract you, some follow you, some touch you and others wait until you least expect it before making a move. Some performers near the end actually almost surprised me, which no other haunt I have reviewed for this website has managed to pull off. There were also a few clever setups involving positioning which I won’t spoil by explaining further. In addition to rooms featuring just monsters, there are also several scenes and static displays. The free candy at the end was also a pleasant surprise. The basement itself provides a lot of great atmosphere and as a haunt catering to all age groups, there’s little to no blood on display. The props range from the kind you can find at your local pharmacy to high end (along with some cool homemade ones) which makes for a good mix considering the target audience. It’s also understandable since all proceeds are donated to the Greater Boston Food Bank. The layout was well-chosen and helped the 5 minute tour feel much longer. Believe me, I mean that in a good way. I was very pleased to see how all performers wore full costumes. The only “mask and street clothes” one in the bunch was the guy who announces the level you selected and he has a valid reason for that. Going into a room with dim red lighting and scary sound effects blasting away can be very intimidating for younger children and being able to switch from a monster to a person is extremely important in those circumstances. Given how some last minute scheduling issues resulted in me attending later in the evening and it was their busiest year yet, I was impressed by the performers’ energy (especially since they did not have any breaks). However, there were a few issues with my trip through the haunt. I caught two actors having a conversation and had to interrupt them so they could actually go through their routine. I give them credit for trying to make it work, though. There was another point where a performer seemed to have temporarily abandoned their post and left their mask behind! This being a busy year had another effect on the haunted house. The scenes and scares are subject to change each year and I understand this year saw little change due to everyone’s work schedules being heavy. But other years have had numerous changes and they tentatively plan to change every room for 2015. Thankfully the increased level of traffic seen this year also resulted in the Greater Boston Food Bank receiving about $2,150! All these factors made it hard to pin down an exact rating for the Newton Haunted House, so I had to fudge things a bit. It’s definitely equal to other charity haunts I have attended and surpasses one for profit haunted attraction previously covered here. I’m sure you will enjoy yourself if you visit (and that next year’s incarnation will be a real treat). UPDATE: It turns out Lisa Barrett (the ticket taker) is a famous researcher and published author specializing in the study of emotions. She uses her knowledge of fear to train the haunt’s performers (who are also members of her lab) how to be as creepy as possible! I have also been informed the level announcer is her husband, who wears street clothes as part of his costume so his Greater Boston Food Bank shirt can help further promote the organization. Sadly the Newton Haunted House is now permanently closed! The haunt’s website has more details and you can see more photographs from the haunt on its official Facebook page. Special thanks to The Newton Haunted House for use of the image!